What is it like to fly China Eastern Airlines? If your travels are within China, there’s a good chance you’ll fly China Eastern Airlines. When we recently visited Beijing, we flew out of Terminal 2 from Beijing (PEK) on China Eastern Airlines Flight MU 2106. Our destination: The city of Xian (XIY), home of the terracotta warriors. Because we had no idea what type of aircraft we would be flying and the skies were extremely foggy, I was a bit apprehensive. Yet, except for a very lengthy (four hour) departure delay, the 1-hour, 40-minute flight itself turned out better than expected. Headquartered in Shanghai, China Eastern Airlines is one of the three major state-owned transport companies in China. The carrier flies both domestic and international routes in Asia, North America and Australia, and has had codeshare agreements with WestJet, Ethiad Airways, Japan Airlines, Qantas and Virgin America (as part of the SkyTeam Alliance) since January 2013. Our Airbus A321 was a much larger plane than I had imagined, with a business class section followed by two large economy cabins configured with three seats on each side of the aisle. We were seated at the back of the plane in Seats 49 A and 49B (a window and middle seat). The plane looked fairly new and clean but was pretty minimalist in design and decor. Legroom was ample. It would have been nice if the seats had been better padded but for a short haul, they were comfortable enough. One interesting twist: The colors of contiguous seatbelts alternated between red and blue. Thus, you could readily identify your seatbelt and distinguish it from that of the passenger next to you. What a nice innovation—one that we had never seen before but which makes so much sense. For lunch, we were served a hot, soggy-looking chicken sandwich wrapped in foil. I guess the meal might have seemed more appealing if we had been desperately hungry. Compared to most carriers in the U.S., we were quite surprised that any food was offered on such a short flight. Contrary to the Western convention, soda, juice and water were served after rather than before the meal. The young flight attendants were dressed in attractive blue uniforms with big red elastic cinch belts, like those popular in the 50s. Although most had only limited English, they were generally responsive to passengers. There were no seatback entertainment systems but a drop-down screen at the front of the cabin provided easy-to-follow, animated air safety instructions, first in Chinese and then in English. Since we never heard a flight crew say that before, it was somewhat refreshing. As one might expect, the glossy airline magazine, Aviation Culture, was written entirely in Chinese. We arrived safely, having felt comfortable and well taken care of on the flight. However, because the flight took off four hours late, we missed a good chunk of time that we had hoped to spend in Xian. 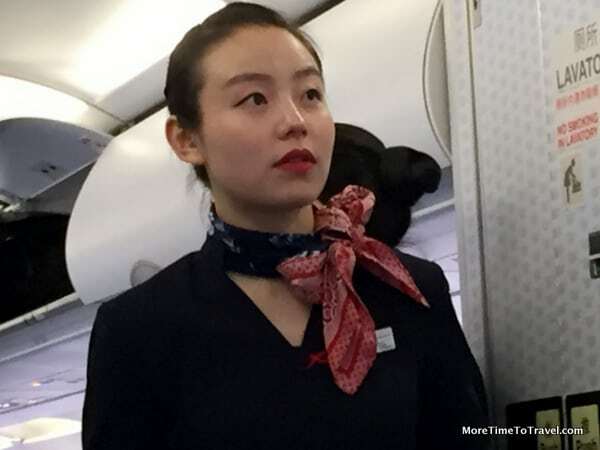 Just before takeoff, each passenger was given a cash payment of 150 Yuan, about $25, for the inconvenience of the delay. In the U.S., it’s more common to get a voucher that you can use for a snack at the airport. The biggest problem (and frustration) with the flight, however, was the lack of any communication explaining the reason for the lengthy delay. Locals we met warned us that most Chinese airlines routinely delay or cancel flights. A recent article in the China Daily (April 8, 2015) may explain these aviation problems, in part. It noted that the available air passage space for civilian flights in China is only one-third that of the U.S. and that the number of air traffic controllers is about one-half. Fortunately, our return flight back to Beijing left on time. Although I didn’t have any need to use the lavatory on the short flight, I did peek in before we deplaned. In case you’re wondering, the plane had Western-style toilets with toilet paper rather than the squat toilets commonly found in public places in China. For more information, see the China Eastern Airlines website. What is it like to fly Cathay Pacific Premium Economy? What an interesting post! I share your reservations about airline travel in Asia as I had a few dodgy moments in Vietnam that prompted me to opt for the train on the next visit. But China Eastern Airlines sounds like a decent enough airline although a 4 hour delay is a bit crazy. The extra legroom would be welcome and who wouldn’t be happy with an inflight featuring pandas? I was very interested to read these details as well, particularly the extra legroom – which seem to be something that has “gone with the wind” in the rest of the world! Regional airlines can be hit and miss. I think we might have been a little miffed about the $25 voucher, but what can you do? We actually were surprised that they handed out cash on the spot! I found it interesting to read about flying on China Eastern Airlines. The colour-coded seat belts are a good idea, but I admit that sandwich doesn’t look at all appetizing. I’ll be doing this same route next week, only on Air China. I’ve been wondering about what the differences will be compared to American airlines. I was hoping for some Chinese food! If you have the opportunity, which you probably will, try the congee for breakfast! Irene, I just finished my delayed comment on your last week’s post. I am now back in Phoenix and will be more regular again. Sorry but wifi problems added to the stresses of traveling. 4 hours delay without knowing why? That would have taxed whatever little patience I have. More leg room and $25 would not compensate especially if I was hungry and was given just that soggy sandwich. Oh but I guess land travel is not practical in big China. I wonder…rail. I haven’t been to China except Shanghai. Yes, four hours is a very long delay but so common these days, here and abroad. Did the announcement voice sound like Siri? And, wow, that sandwich looks…squished. Delayed and canceled flights are just a part of air travel. Weather plays a huge factor in this as well as mechanical issues. I much prefer they err on the side of caution and delay a flight rather than take unnecessary risks. When in China I visited Xi’an but took an overnight train from Beijing to get there and it was good. Looking back, train travel would probably have been more reliable:-) The weather was very foggy, which I heard is quite common there. I’ve travelled by train. At that time, (things may have changed), there were two classes.. Hard seats and soft seats. The latter on which we travelled, were extremely hard so I wonder what the ‘hard seat’ segment would be like. Toilets were a hole and a squat. Tea was offered often. Best to bring along some snacks. However, all that said, it is a wonderful way to see the country side and the workers who seemed overworked, rounded back and never looked up.All that said, I love China to the point that I have a Chnese travel mag. http://WWW.MENG08.COM, translated in the Chinese for the mainland traveller who is now able to travel out of the country. Alternating colors of seat belts — brilliant! I like the “Please don’t worry” announcement, too — as long as their voices are also calm! Very interesting to get a peek at what it’s like to fly different airlines. I was also impressed by the leg-room, seat belt colours and the cash – seems like they are trying to do some things right, and my guess is that the 4 hour delay may not have been the airline’s fault. Interesting article. It’s surprising what a difference small details can make to a flight. I’d have appreciated the extra leg room but I don’t think I’d have wanted that sandwich! Love the idea of different colored seat belts! I would have passed on the soggy sandwich. Good to know about the frequent delays, at least you can kinda plan on it. That sandwich! Yikes. Hope you had another snack with you, thank goodness it was a short flight.